WooHoo! Can you believe it! 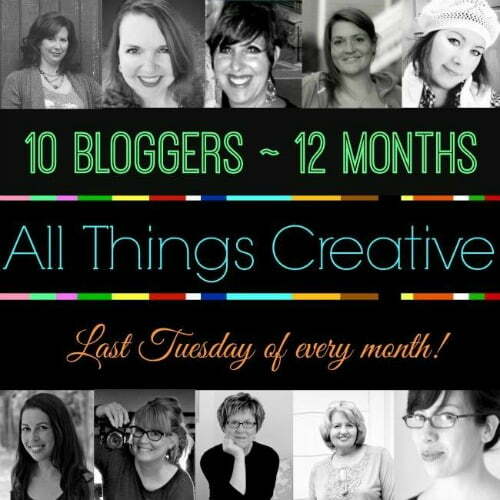 It’s that time of month when a group of my blogging friends and I get together to bring you our best ideas on a particular topic, and this month it’s all about Thanksgiving. 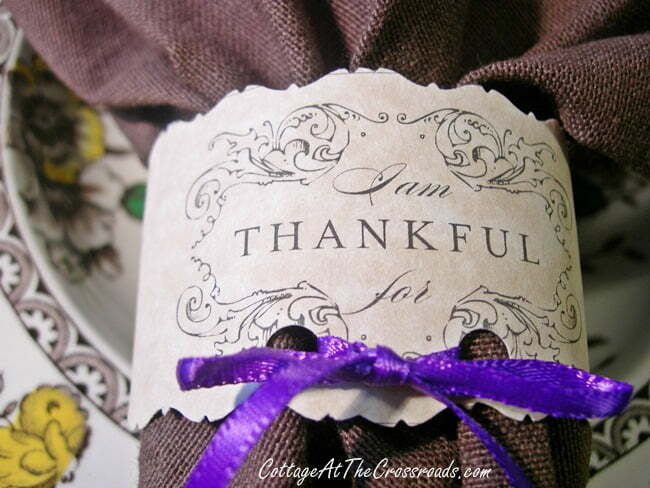 Thanksgiving is one of my favorite holidays because it is centered around family, food, and fellowship. I love to set a pretty table if I’m hosting. But did you know that we never have turkey for our Thanksgiving meal? That’s because Leo is allergic to turkey and all fowl, including chicken. So we have a non-traditional main dish such as a pork roast or ham. 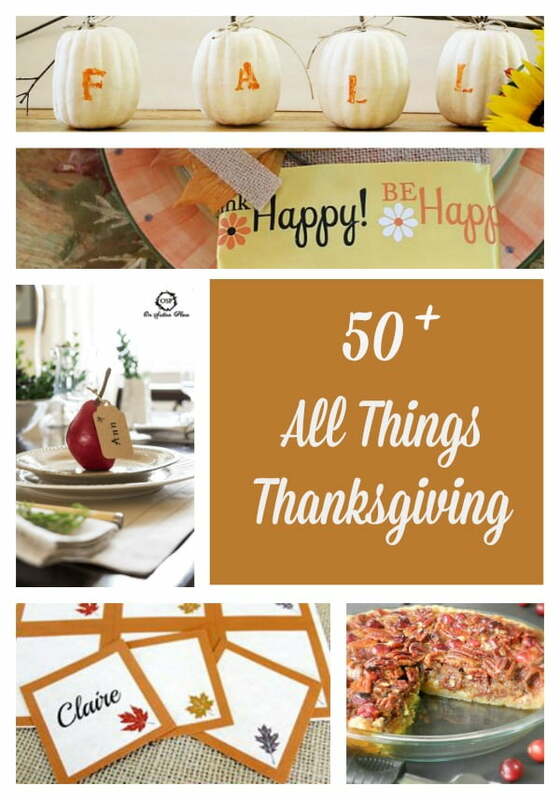 Anyway, my creative team has rounded up lots of recipes, crafts, and tablesetting ideas for your holiday celebrations. 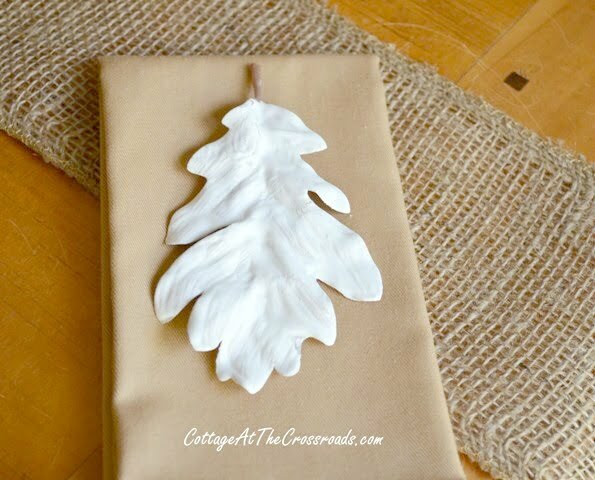 So I dug around in my archives and found this post from two years ago where I made these plaster leaves to use on my Thanksgiving table. 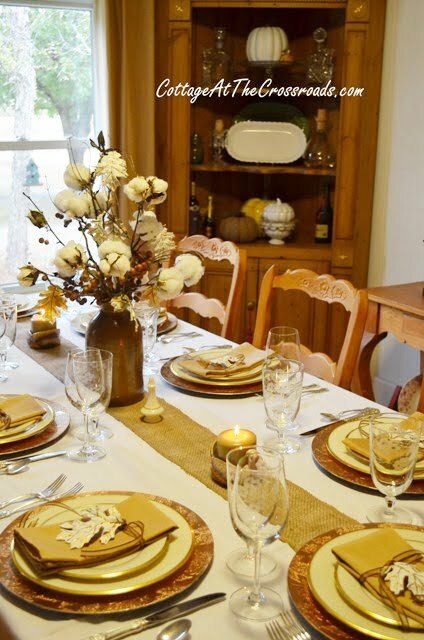 You can see the leaves as well as the whole tablescape where I used cotton in the centerpiece in this post. 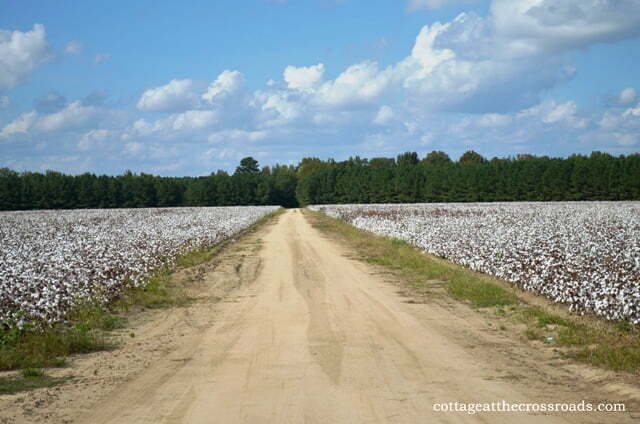 And speaking of cotton, here’s a post I did about my family connection to this important crop. Now I’m really reaching back to show you some paper napkin rings that I made three years ago because I couldn’t find any napkin rings to match the china I was using that year. But they were a hit with our family and a conversation starter. I don’t think I’ve ever had a Thanksgiving meal when we didn’t have collards on the table. Here is Leo’s recipe for them which he got from his mother. They are oh, so good! So, as you can see, we have quite a collection for you this month. And if you don’t have time today to visit all the links, just pin the following graphic so you’ll remember where to find them all! I enjoyed the round up Jane! 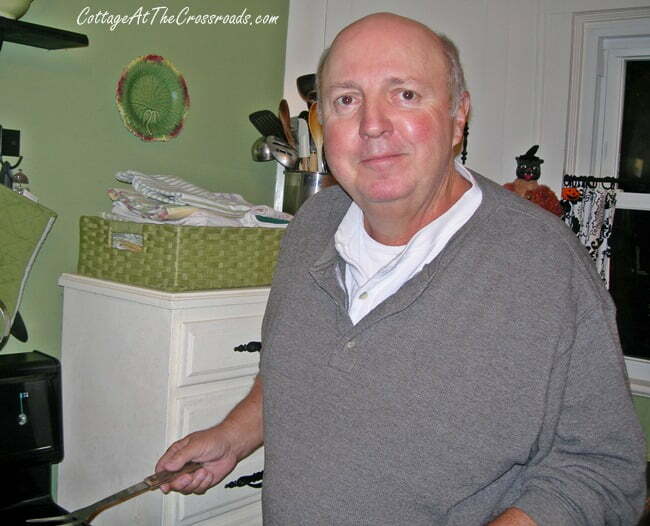 I had to go back and see how Leo prepares his collards and purple Thanksgiving table! I really like the leaves they are gorgeous and all the other posts.Have a great day. Gosh, I needed this today! Thank you! 3 things, Jane…1. the plaster leaves are genius. 2. I would give my left arm for some of that cotton. 3. Tell Leo that I would probably give my right arm for some of those collard greens. What a special recipe! I remember those plaster leaves!!! I can’t believe it was 2 years ago. Loved seeing the pic of Leo too. Wow Jane, this post is so full of delicious looking food that it makes me hungry just looking at it. 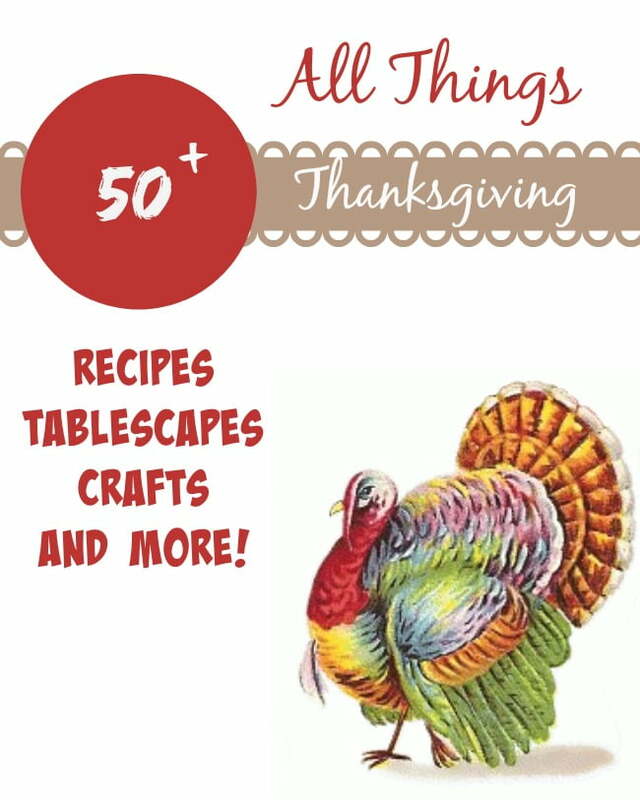 It certainly puts me in the mood to get cooking for Thanksgiving! I wanted to let you know that I never got any green pumpkins on the vine that I planted but the one that my dad planted has baby pumpkins. We hope that they don’t get killed by frost before they mature and he is planning to cover them to try to protect them. I’ll keep you posted on the outcome.